Bomber jackets are making a serious come back this Fall season and I am completely here for it. 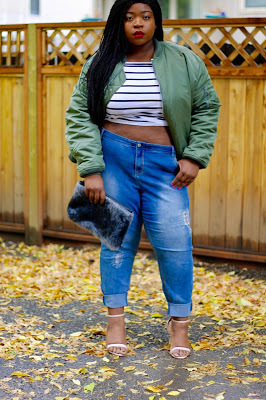 Personally, I rock bomber jackets in pretty much every season due solely to their comfort level, but rocking them in Fall opens up an entirely new door when it comes to styling them. In other warmer seasons, the bomber is more of an accent piece thrown over a dress or to dress down a look. In winter the bomber is used primarily to insulate our bodies from the cold, but in Fall, these jackets can be utilized as an actual styling piece. For this look, I've decided to style this bomber jackets, which I luckily snagged from a VV Boutique (read: Value Village) last year, very casually. I added interest to this olive green beauty with stripes and fur accents. Along with minimalist strapped sandals and boyfriend jeans that I rolled up, this look is easy to throw together for a casual brunch or dinner with the girls this Fall!